I, Murray and I drive downtown to go to the Haus der Kunst (House of Art) to see some modern artworks. All I can say is WEIRD! I don’t understand modern art and it is not my definition of art. It must be someone’s (the artist’s?? ), but not mine. I cruise by the pieces looking at them and try to expand my mind and artistic sensibilities, but I am not sure the art will leave as lasting an impression as a Van Gogh. 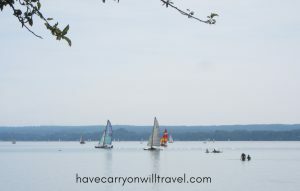 In the afternoon, the four of us drive to Ammersee, a lake about 35 km outside Munich. We eat and drink at a typical Bavarian beer garden. It is a glorious hot day, and the lake, beach and beer garden are busy. Swimming, sailing, paddling and sunning are the enjoyment for this wonderful September hot weather. Tomorrow we must say goodbye to our friends as we are off to Weimar to follow the Bauhaus. This entry was posted in Germany and tagged Germany, Munich. Bookmark the permalink.